After a weekend of comedy and faith lectures, the Bay Area participated in another lineup of Martin Luther King Jr. celebrations in the Bay Area on Monday to honor a legendary civil rights leader who would have turned 88 if he had not been assassinated. Some of those events include a community breakfast in San Francisco, a film festival at the Yerba Buena Center for the Arts and a march and parade at the San Jose Diridon Caltrain Station. 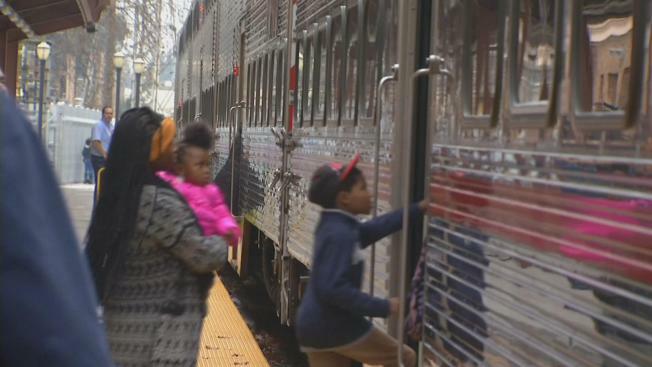 The highlight of the day for many, however, was a free ride on the "Celebration Train," which takes riders 50 miles from Silicon Valley to the MLK festivities in San Francisco. As of Monday, all the tickets were handed out. Al Turner, who was born in Oakland and now lives in San Jose, came out to ride the train ride to show the world that it's important to "keep up with being forward... (Yet) somehow we find ourselves being put back out under the bus." Turner added that King's legacy is to remember than the human race is one race and "we need to love each other," which includes the often divisive President-elect Donald Trump. "We are all citizens," he said. "May we support him as well." A similar free ride called the "Freedom Train" took place for 30 years until discontinuing service last January because of budget problems. The new ride is a partnership by Caltrain and the Northern California Dr. Martin Luther King, Jr. Community Foundation, which is now in its second year of existence. 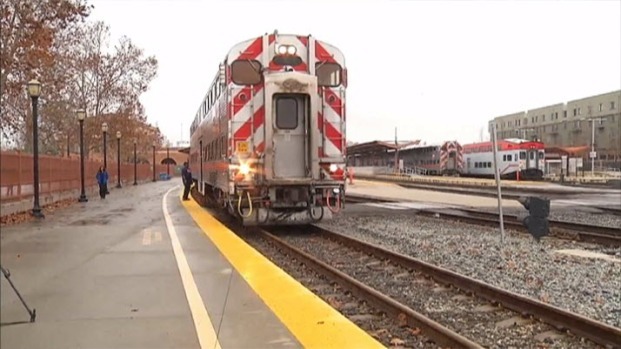 Caltrain spokeswoman Tasha Bartholomew told NBC Bay Area on Monday that after the now-defunct Dr. Martin Luther King Jr. Association of Santa Clara Valley couldn't afford to sponsor the free tickets anymore, the transit agency decided to keep the tradition alive by chartering a train at a cost of $5,000. So far, this year, 1,245 people signed up. Batholomew also said that the original organizers asked that Caltrain rebrand the effort and call it something other than the "Freedom Train," which is how the name "Celebration Train" came into being. The 50-mile Bay Area ride symbolizes the 54-mile march King made with other activists from Selma, Alabama to the state capitol in Montgomery in March 1965. Here is a full list of events sponsored by the Northern California Dr. Martin Luther King Jr. Community Foundation. Screening of “Hidden Figures,” the story of three African-American women mathematicians working at NASA in the 1960s at the Grand Lake Theater in Oakland at 8 a.m.
Allen Temple Health and Social Services Ministry presents MLK Jr. drum major for freedom celebration breaking at the Oakland Airport Hilton. Rep. Barbara Lee, former Rep. Ronald Dellums and Elain Brown, former chairwoman of the Black Panther Party are expected to speak at 9 a.m. Lee has said she is boycotting President-elect Donald Trump's inauguration in Washington, D.C., on Friday. So are at least 25 other Democrats. 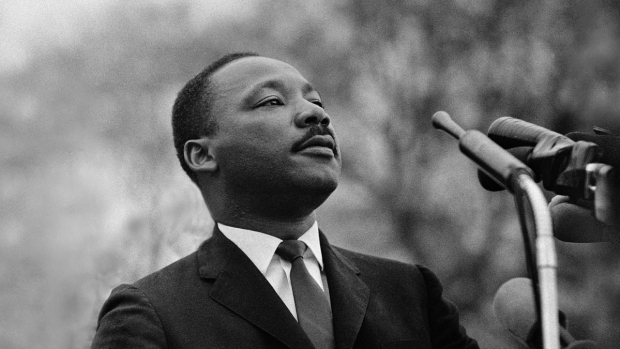 Celebrations Abound to Honor Martin Luther King Jr.
A host of events on Monday, including an annual luncheon in San Jose, are honoring the late civil rights leader. Rick Boone reports. 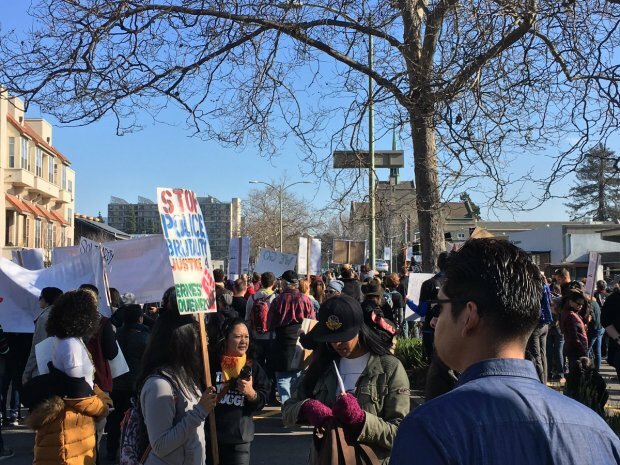 The Anti Police-Terror Project is hosting a "Reclaim Martin Luther King Jr.'s Radical Legacy" rally and march oto Lake Merritt at 11 a.m.
About 2,000 youth and adult volunteers will work at 14 projects around Oakland. Kickoff event to launch Muslim-Catholic partnership between Catholic churches and South Bay Islamic groups at 4415 Fortran Court in San Jose at noon. Mitzvah Day at the Oshman Family Jewish Community Center in Palo Alto at 8:30 a.m.
Canopy’s second annual East Palo Alto’s tree planting event and MLK Day of service at 10 a.m. at Jack Farrell Park, 2509 Fordham Street. Workday events building outdoor gardens at Vallejo High School and Dan Root Elementary School in Suisun City at 8:30 a.m.
Community service in downtown Napa, followed by a 7 p.m. interfaith celebration at St. John the Baptist Church, 960 Caymus Street.